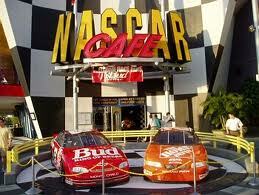 Located within the Universal Orlando Resort at CitiWalk, the NASCAR Cafe is a full-service upscale sports bar that is a must-visit for any NASCAR fan. Dedicated to great food and a good time, the cafe is officially affiliated with NASCAR and is easy to spot with two race cars located just outside its entrance. Inside, the cafe is filled with NASCAR memorabilia and décor, as well as large plasma screens so that all diners can watch races while they eat. There’s also an authorized NASCAR shop where you can dig up a souvenir before you go. The retail shop opens at 9am, while the cafe is conveniently open from 11am to 12am. As for the food at the NASCAR Cafe Orlando, all the American favorites are served along with popular finger foods like fried pretzels and nachos grande. Many menu items feature as NASCAR theme such as the Talladega Cheesy Burger and the Pit Road Burger. Burgers and classic sandwiches make up a large portion of the menu, though soups, salads, seafood and pasta are also available. There are plenty of hearty entrees to be had such as the BBQ Pulled Pork Platter, Rubbin’ is Racin’ Ribs, Chicken Parmesan and Top Sirloin. Side orders of fries, coleslaw and “smashed” potatoes can be added to any meal. For lighter fare, a few good options are the Speedway Caesar Salad or Half Track House Salad. The restaurant also comes with a fully stocked bar and an arcade and games area for kids.